Saskatoon, Sask. and Toronto – June 26, 2017 – UFCW Canada activists from across Saskatchewan and Southern Ontario proudly celebrated diversity and equality at Pride parades in their provinces on the June 24 weekend. Toronto – June 21, 2017 – UFCW Canada welcomes the passage of Bill C-16, which has now received Royal Assent from the Senate. Winnipeg and Edmonton – June 12, 2017 – UFCW Canada activists recently kicked off the 2017 Pride season in the Prairies, marching loud and proud at Pride parades in Winnipeg and Edmonton. Toronto – May 13, 2017 – The International Day Against Homophobia, Transphobia, and Biphobia (IDAHOT) is celebrated each year on May 17 as a day to speak out against LGBTQI2S discrimination. Toronto – April 7, 2017 – The International Day of Pink is commemorated on the second Wednesday of April as an annual reminder that bullying has no place in our society. Toronto – February 16, 2017 – UFCW Canada and UFCW Local Unions led the way at dozens of Pride Parades across the country in 2016. 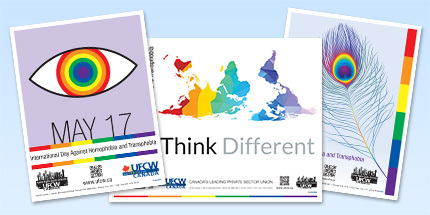 In advance of the 2017 Pride Season, UFCW Canada has produced a new resource guide – Creating a UFCW Canada Local Union Pride Committee.